This past week was fierce. For those that might be new, I am in the midst of two large and important activities. On the one hand, I am trying to search for a new job, preferably in the IT field (Linux/Unix server admin etc.). On the other hand, I am trying to find out if I can do enough things to just work for myself. To that end, I am starting up a business doing handyman/home repair work. I’ve been trying to get the word out via social media and the Internet. There are a lot of things to set up to do that. In addition, I had a couple of repair jobs to do this week and I had some call backs on applications. The final pieces to this fierce week were a 16 mile long run and a three day class on learning how to become a League Cycling Instructor with the League of American Bicyclists. The long run went well but I had to squeeze it in on Thursday so that I would have time for the class. In addition, I had stuff to do beforehand to get ready for the class. This part of the journey on my path happened to come about because of a dedicated lady in my city that somehow got into contact with me about helping with our city’s Bike Lane Task Force. I got connected with the task force through responding to a call for volunteers on NeighborsGo. I’ve helped with several things on the task force and some time last year, she asked several of us if we would commit to becoming League Cycling Instructors (I’ll just use LCI from now on). Not really knowing what I was getting myself into, I agreed and this past Spring, we did the first step by spending an entire Sunday afternoon in a church parking lot learning how to ride a bike. Yes, you would figure after 6 years of cycling I would know, right? I was so wrong. Yes, I could ride, but could I ride safely on city streets and control my bike in emergencies? Those I had to learn, even though I had commuted for a good while in the past, but also what we as future instructors need to know as well. And, that was just step one in the process. From Friday evening, all day (and part of the night) Saturday, and most of Sunday, we brave few candidates went through an exhaustive list of things we would need to know about not just riding, but also teaching others how to do the same. The candidates and the instructors were a very varied bunch coming from all over the Dallas County area and two (the chief instructor and one candidate) from Austin. After this much time in class and out on the bike, I slept really well last evening. We spent a great deal of time in class work where we not only learned all the information and issues that cyclists need to know, but also that we as future instructors need to know as well. We also spent the classroom time practicing how to teach others about everything from traffic law to basic bike maintenance, in teams and individually. We had to learn how to approach dealing with many different age and skill levels of riders as well as how to adjust and teach cycling safety in an age-appropriate manner for children. 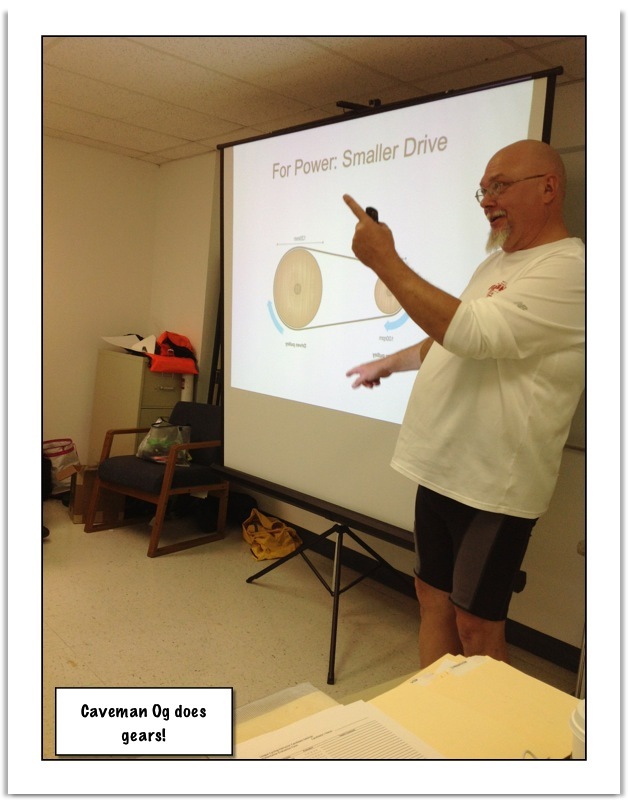 This is my individual presentation on Gearing, Cadence, and power output. I used “Caveman Ogg’s” bike for reference. Out in the parking lot of the facility we were using (generously offered to us by Keep Irving Beautiful), we had to learn how to teach and prove we were competent in basic handling and avoidance skills on the bike. Our added challenge to this was the clock that timed us and the fact that this weekend was the first real cold spell for this Fall. The days hovered in the lower 50s and a North wind as well. Our teams all managed to get through this exercise and to be observed and graded on the skills on Sunday. Then, it was out on the street. Each of the candidates had to spend time taking our team (we were all placed in teams of 3 or 4) out on the road and through intersections while ‘practicing’ as an LCI. This was possibly the toughest part for me. While I ride quite a bit, it’s usually alone. That is a difficult task when riding city streets, but when you become responsible for a group of other riders (and in Real Life they may be novice cyclists), the anxiety level rises quickly. Because of the facility location, our chief instructor chose what I would consider one of the really busy intersections in my area. That added to the stress of guiding a group around and through traffic while also watching their progress and then shifting off LCI duties during the ride to others. On Saturday afternoon, we all practiced learning the skills we would need on training road rides and on Sunday afternoon, we had to do the task for real and be observed and evaluated by our instructors. Our group had learned through Saturday’s ride that we needed to communicate clearly, loudly, and effectively in order to get everyone around the intersection safely. It’s a great feeling of accomplishment to complete a skill like this, at least, it is when you can get everyone safely back to the classroom. We were all quite exhausted when Sunday afternoon rolled around, but we were happy when our instructors and evaluators finished their chore of determining if we were ready to be full-fledged LCIs. I believe we all succeeded in passing the test, though we must now wait upon the League to finish up our paperwork and assign us our LCI number. We all met privately with our instructors to hear how we did so I cannot speak for certain. Though we will all be restricted for a while because we must teach for a period with another qualified LCI, a few, like myself, have added restrictions. In TS101 (our first class) and still today I have difficulty doing a correct quick-stop (it’s harder than you think). So, I will have to improve upon this one before I can teach the skill. I cannot say enough good things about our instructors. I’ve chosen to use no names in this post because I respect theirs and others privacy. They possessed a wealth of knowledge and freely gave themselves to the task of both teaching us and encouraging us that we can succeed as instructors on our own. Cycling and cycling advocacy are very important to me. I want people to realize that the path to better health and a greener planet is possible on the bike. Being an LCI is a huge responsibility and I will have to learn how to seriously execute that task. But, if it can result in my city gaining more riders, safer riders, and helping all of us–motorists, riders, and pedestrians–to use our roads and pathways together, then it will be worth the sacrifice. Finishing LCI training is not an end, but a beginning of sorts. We left class with assignments on taking our new knowledge out and putting it to good use for our neighborhoods. In one weekend, my city went from only 1 LCI to gaining 5 more, so I am encouraged that we can do well. I look forward to being able to share with you all what happens next. Stay tuned and I’ll let you know when my LCI number arrives. Happy cycling (and running too)!